In my years of coffee sipping and exploration, I’ve gone through a lot of different machines. From drip to percolate, french press to pour over, and now a really great semi-automatic that I love. If I’m not looking for a better-tasting cup, I’m replacing a broken machine. Admittedly, early on this is my own fault because I wasn’t ready to invest in a quality machine until I moved on to my Breville. Sub-par coffee and machine replacement is always a serious disappointment. When you add up what I’ve spent over the years, it almost certainly equals or surpasses some of the machines we’re looking at here. The Final Shot: The Jura Impressa F8 is our top pick for the under $2,000 budget range. The Swiss-made quality, fully automated brewing system, extra quiet and speedy grinder and range of customization options put it on another level. 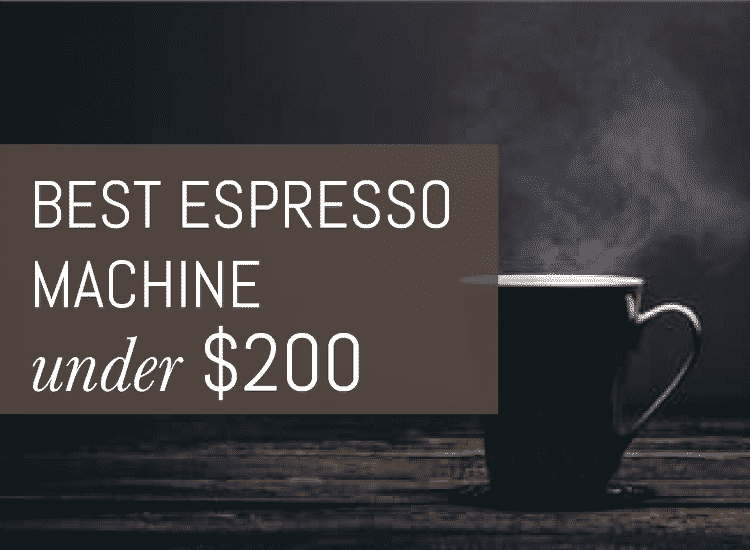 While all of the options on this list are definitely not in the average budget, if you’ve saved or if you just have the extra cash to spend, you’ll find each of the machines here will offer a unique and incredibly satisfying espresso experience. 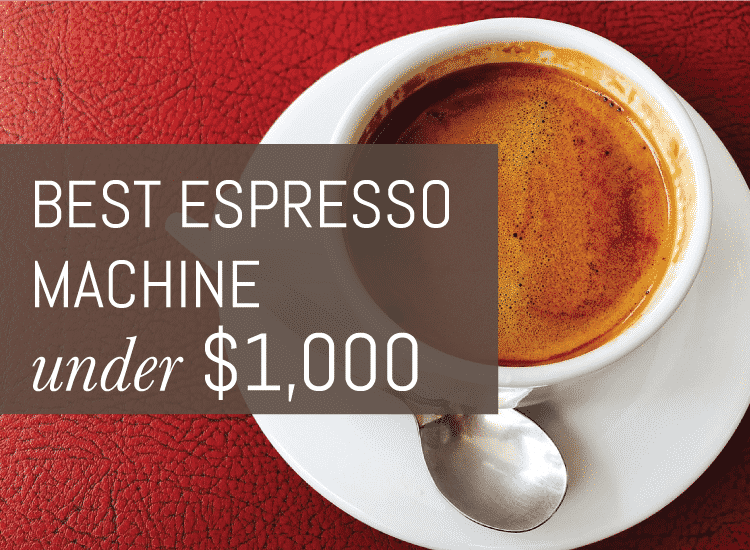 Why spend $2,000 on an espresso machine? For those of us to whom coffee is not just a beverage but a way of life, a one-time investment in any of the following machines will pay for itself in convenience and superiority. I also dare you to add up what you spend at your local coffee shop each week, month and year. It might really surprise you. We’ll start with my personal favorite here and overall top pick, the Impressa F8 from Swiss powerhouse, Jura. We will also take a look at two other great options from Gaggia and Breville. First off, let’s take a look at the Swiss-made Jura Impressa F8. It’s by far one of the best engineered and thoughtful espresso machines I’ve ever seen, and it has the added bonus of being user-friendly. No need to be intimidated by foaming techniques or ratios of milk to espresso as the Impressa is a fully automatic espresso machine and takes care of all of that for you. If you are a fan of LCD screen integration in your appliances, the Impressa is definitely going to satisfy the techy side of you. Use the rotary switch on the top of the color screen to scroll through brewing options, and press the button to select your beverage of choice. Then sit back and watch as it serves up a latte macchiato, cappuccino, espresso shot, or whatever other drink you choose. It can be tricky to master the perfect micro-foaming technique with a steam wand, but the Impressa eliminates the need to monitor your milk foam. It acts as your own personal barista by running cold milk through the machine and turning it into perfect foam on demand. 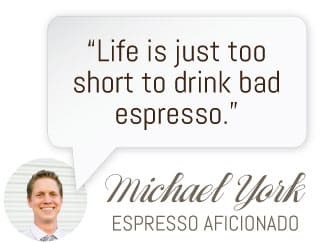 If you are taking coffee orders for your guests and one of them asks for a decaf, you don’t have to spend extra time cleaning out the grinder. There is an additional powder chute that allows you to pour pre-ground coffee directly into the machine, so you can go from caffeinated to decaffeinated instantly. I also love that the grinder itself also features Aroma+ technology to preserve the integrity of the bean, reduce noise and grind 2 times faster than most conventional stand alone grinders. If you’ve read more than a few of my articles, you know I’m a stickler for grind quality and convenience, the Jura really outperforms most everyone else on both counts. Or you can use the chute for other roasts or flavors that you don’t use as often but would still like to sip every once in awhile. The Impressa also comes equipped with an adjustable spout that can accommodate glasses of all heights, even travel mugs if you’re on your way out the door. Customizability is also a major sweet spot with the F8. You can select both your brew strength and amount to tailor your drink to your specific preferences before milk foaming and frothing. The Impressa is such a well-designed machine that it’s sure to last a long time, but it’s worth noting that fixing a machine like this will be expensive outside of the warranty. You should also be aware that having a real espresso maker requires following a schedule for cleaning and maintenance. Next up, let’s take a look at the Gaggia Accademia Espresso Machine. Its name evokes the image of a tweed-coated professor sipping coffee in an ivy-walled campus. If you feel like it’s time to graduate to the next level of home espresso brewing, the Accademia will earn top marks. Worth mentioning right away is the durable design of the Accademia. Bumps, bangs, and spills make no dent on this machine. It’s built to last a long time, and it will not crack or age like cheaper coffee makers. Even the buttons and hinges are well-made, and if you’ve ever snapped a weak lid off a brewer like me, you’ll appreciate the quality and thought that has gone into the stainless steel cased Accademia. 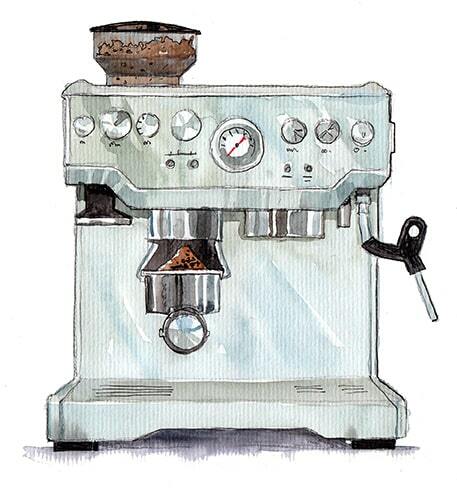 Like the best high-end machines, the Accademia includes a built-in hopper and grinder. The hopper holds a half pound of unground beans and has an excellent seal so you don’t need to worry about stale or flavorless coffee. And if you want to switch it up and use a decaf blend, there is a place to add that, without cleaning out the grinder. The milk frothing system is also really straightforward. Basically as easy as snapping the milk container in and pressing a button. You can even take the container out and store it in the fridge directly, reducing the time you spend washing up. Making perfect foam with a press of a button makes the Accademia a really smart choice for even the least experienced latte maker. Of course, no modern appliance would be complete without a beautiful digital screen and one-touch buttons for brewing your favorite drink. If you find the need to tweak the settings, even mid-brew, the Accademia’s programmable options allow you to make adjustments on the fly. Or just press a button and let the Accademia do the rest. Users of the Accademia also appreciate it for the adjustable height of the spout. Other machines may limit the height of the cup you are using, and if you have a tall travel tumbler or extra large mugs, this may be an important feature for you. Some users notes that the drip tray requires surprisingly frequent emptying, but overall the brewing experience makes the Accademia a really smart choice. Lastly, our round up of high-quality machines ends on a sweet note with the Breville Oracle Espresso Machine. The Oracle is designed a bit differently than our other two picks, with an external portafilter (the metal basket that holds the espresso as it’s tamped and brewed). The Oracle still automatically grinds and tamps the beans, though, so it’s as intuitive and easy to use as any other automatic machine. The dual boilers that heat up and form steam are another impressive design feature. These allow you to brew espresso and froth milk simultaneously, which means the wait time from grind to cup is minimal. The durable 35-pound machine is well able to handle this level of pressure, but there is a valve in case of over-pressurization that would normally cause bitter flavors in your brews. Watch out coffee geeks, because this machine is crazy programmable to the smallest detail. From fineness of grind to espresso extraction time, the Oracle is packed with customization features to bring you not only a great tasting drink, but one that is tuned to your tastes. You can also program the milk froth to your desired texture, depending on your preferences and skill at latte art. You can also program the Oracle to “wake up” and start heating at a specific time, so if you’re like me and can’t really cope with a long warm-up in the morning, this machine is ideal. This heavy machine also sits on a hidden swivel foot so you can easily maneuver it around the counter. Breville has a well-earned reputation for high-quality, thoughtful appliances, and the Oracle lives up to that standard in both quality and design. You deserve a home brewing experience to rival the local coffee shop, and all of these machines will make next level espresso. Each one has unique features that require careful consideration, but once you make your choice, you’ll never go back to using any other machine again.